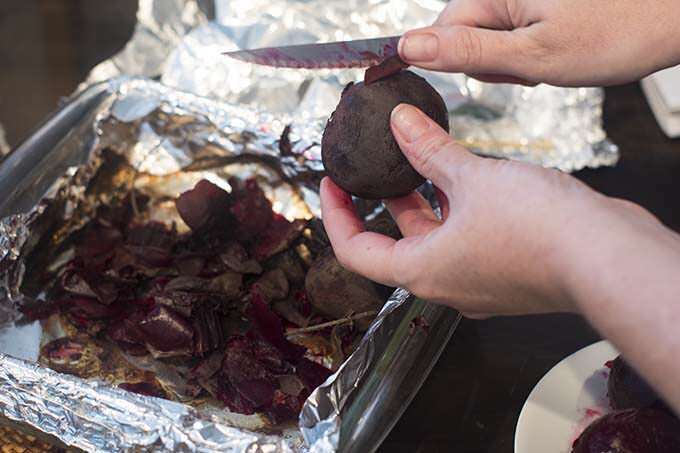 It’s not messy to cook beets if you know the tricks for roasting them with the skins on. Learn how here. I really love beets but dealing with them can be a messy, staining business. 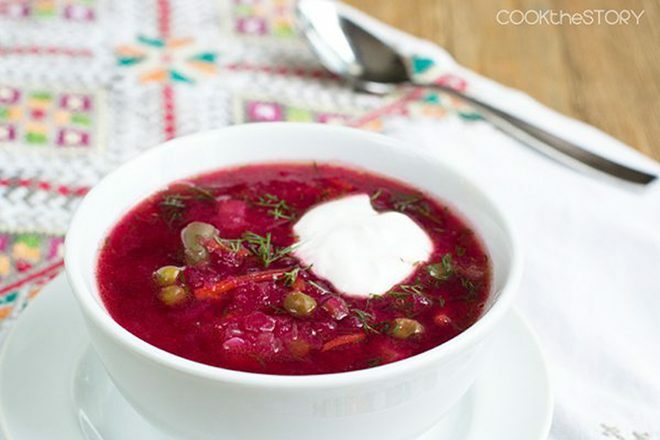 That’s why I came up with this borscht recipe that uses canned beets. It works amazingly well. And while I do love the canned beets in that soup (you can’t even tell they came from a can!) I don’t like canned beets as much on salads. The dilemma: If I want to have beets on a salad but I don’t want to use canned beets and I don’t want a big mess, what do I do? The reason beets are so messy is that when you peel them, you expose their inner juicy scarlet flesh and those juices leech everywhere. I wondered what would happen if I tried cooking beets without peeling them first. I tried roasting them with the skins on and, voilà! Success! Here’s how to cook beets in a way that is barely messy at all. Your counters, and your cutting boards, and your hands will thank you. 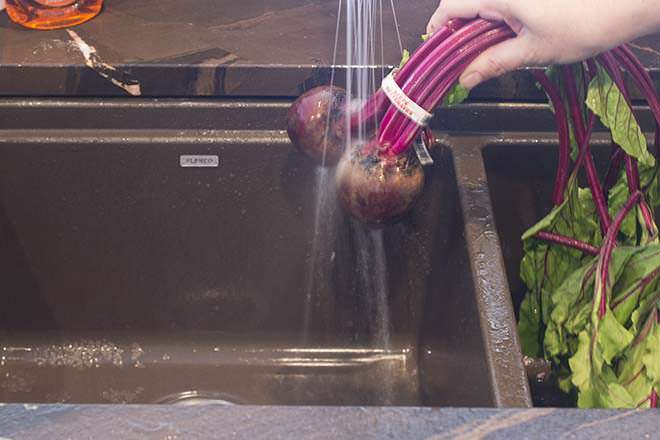 Rinse the beets well. Don’t use a scrub brush or anything though. You don’t want to rupture the skin because that will expose the staining juices and they’ll start making a mess. Just rinse and rub with your fingers. Don’t worry if some dirt clings to near the stems. You’ll be trimming that all off later. For now, trim the stems off but make sure to leave a good inch or two of stem attached to the beet. Why? Because if you actually cut into the beet root you will again expose that staining flesh. Our goal here is to keep the juices enclosed inside of the skin as much as possible. Line a cake pan with aluminum foil. In case any juices do escape, you don’t want them getting on your pans and making a mess. Avoiding mess is the whole point here, after all. 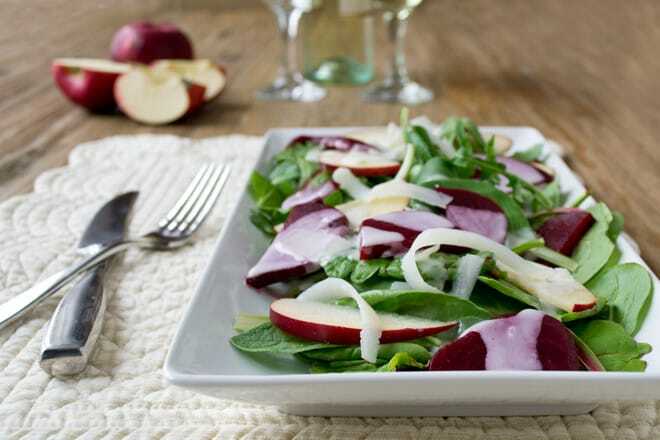 Arrange beets in a single layer in the dish. Don’t pack them too snugly. You want air to circulate around them. 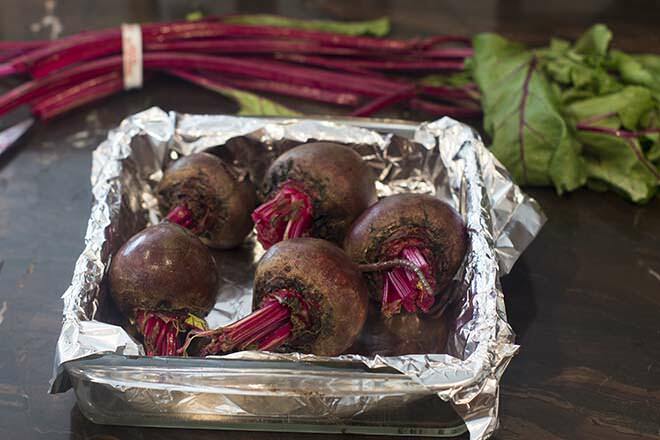 An 8×8″, 2 quart baking dish is perfect for 4-5 medium-sized beets. Cover the dish tightly with aluminum foil. This keeps the heat in and helps the beets cook more evenly and more quickly. The tricky part is timing. Beets really vary in size and, I find, in hardness. Some take longer than others. 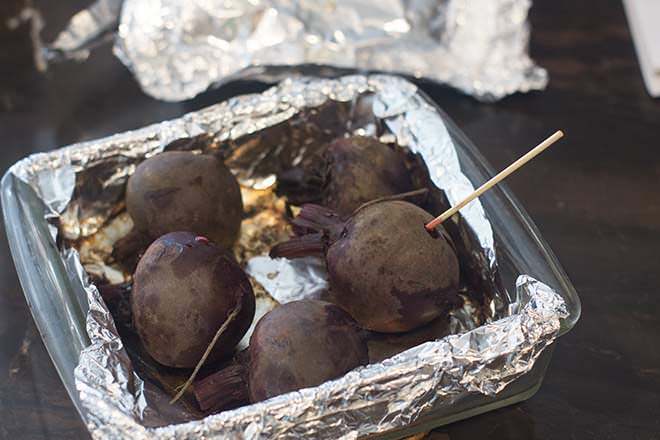 Use a wooden skewer to test if the beets are done. Put the skewer into a beet. If it slides in easily, it’s ready. Unfortunately, here you are puncturing the skin so some of those messy juices will come out, but it won’t be too bad. Trust me. The beets will take between 45 minutes to an hour to cook. Let the beets rest until they’re cool enough to handle. Then use your fingers to rub the skin and peel it off. Keep the beets in or over the dish as you do it. Your hands are going to get a bit messy here but it’ll be ok. Note that some beet skins are stubborn and you may have to use a paring knife to remove the skin. 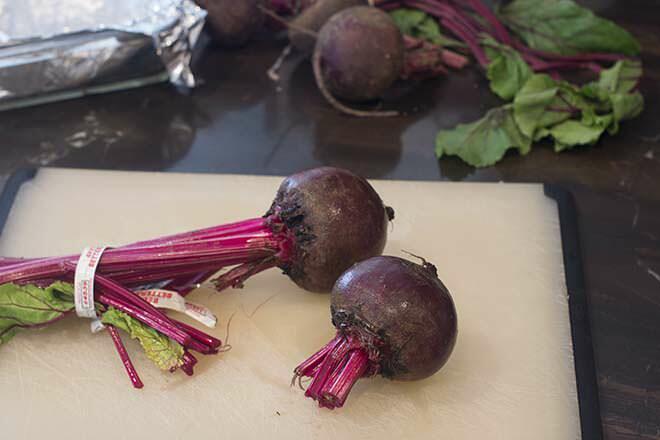 Trim off both ends of each beet and transfer beets to a plate. Now they’re ready to use in a salad or just as a snack. I love them sprinkled with salt and eaten as is. They’re so sweet and delicious! 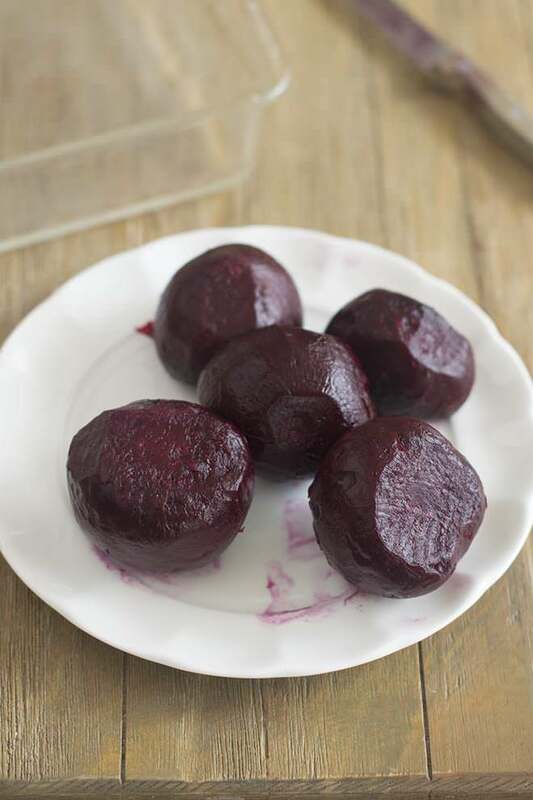 These beets are roasted with the skins on making them much less messy than if you peeled them before cooking. Preheat oven to 450ºF. 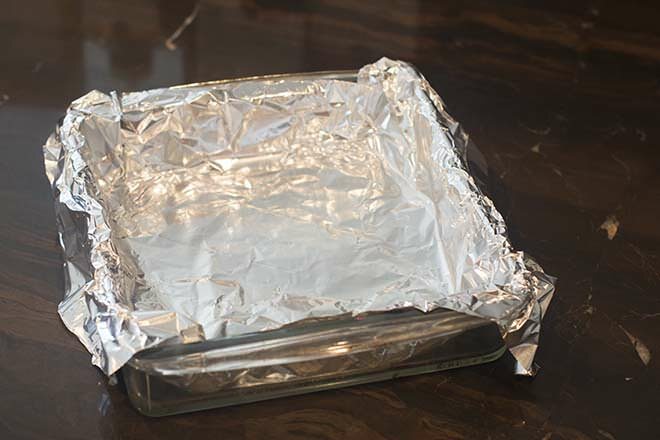 Line an 8×8″ baking dish with aluminum foil. Rinse the beets well rubbing lightly with your fingers. Don’t worry if some dirt clings to near the stems. You’ll be trimming that all off later. Arrange beets in a single layer in. 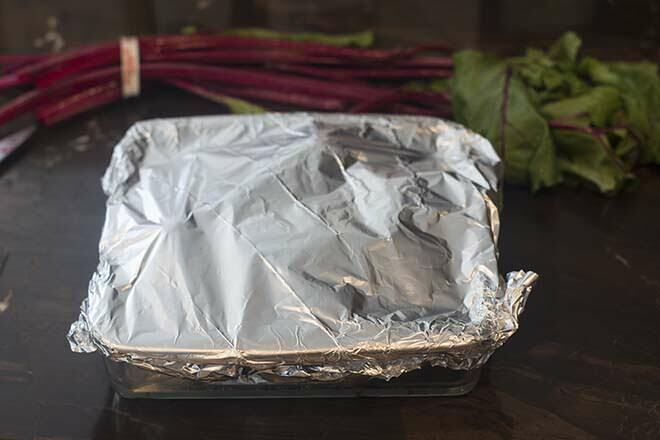 Cover the dish tightly with aluminum foil. Bake for 45 minutes to 2 hours. Beets are done when a wooden skewer slides in easily. Let the beets rest until cool enough to handle. Use your fingers to rub the skin and peel it off. Note that some beet skins are stubborn and you may have to use a paring knife to remove the skin. Trim both ends off of each beet. 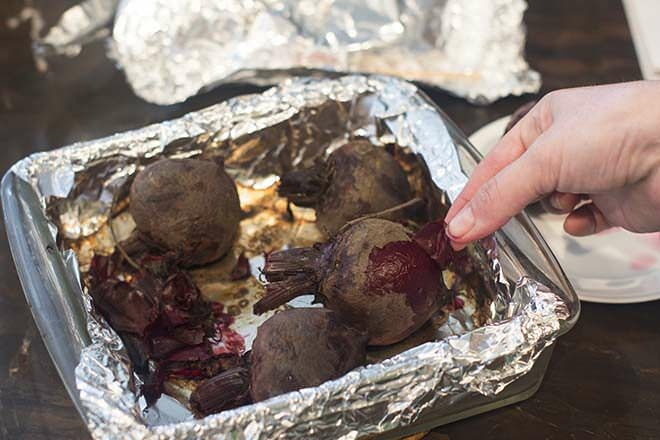 Transfer beets to a plate. Thank you for this recipe. I had to search for 30 minutes to find a simple, straight-forward easy recipe, and you provided it. Looks delicious and will make tonight! I make these for my baby. He loves loves loves his “beets beef rice and butternut squash.” After the beets are washed and dried, I coat them in olive oil. This allows me to slide the skin right off (no knife needed ever); then slice and Julianne them. I roast fist sized beets for 1 1/2 hours. Thanks for the tip, Jilly! I love this method because it’s something I can easily do early in the day and then chill until I need them. It forces me to use the beets because it shortens the shelf life! Kerstin, I make these like every week and always have them in my fridge. I’m addicted for sure! 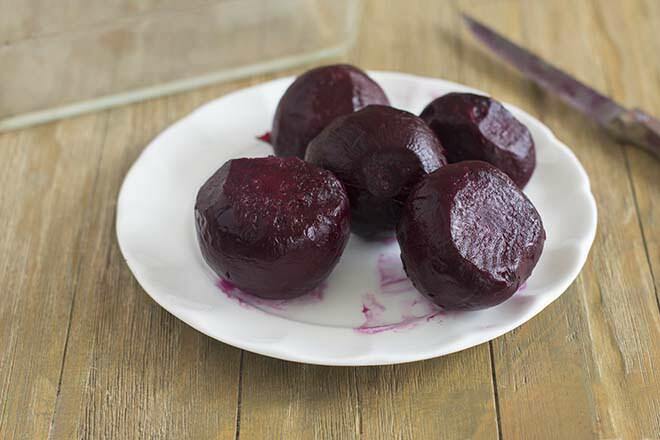 Can you freeze baked beets? Ginny, Yes. Put them in a ziplock bag and freeze them. Then defrost them in the fridge. They change texture a little bit (softer) but are still delicious. 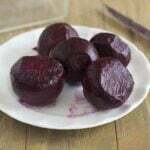 I love beets and I can’t wait to try roasting them and making the Beet Salad. I love your photos showing how to make it too. Thanks! !